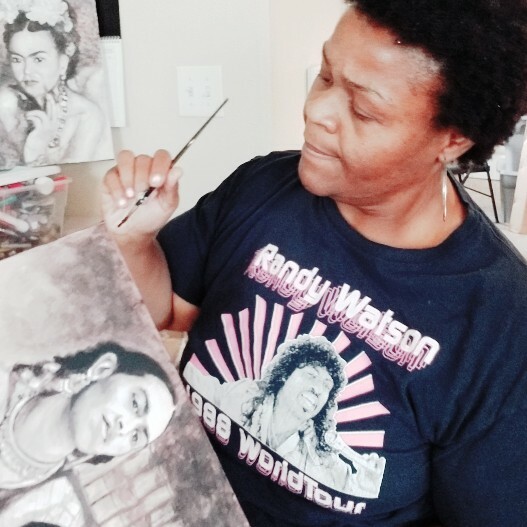 New home, office or bringing a new energy into your loving space, these acrylic paintings are here for you. 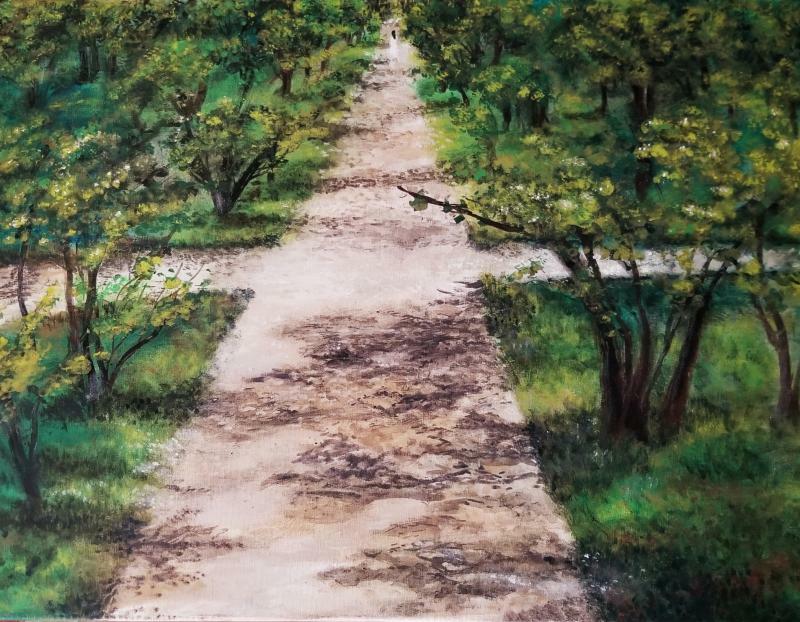 Created: 2019 Size: 16" x 20"
This scene was inspired by approaching new opportunities. Spotting the light at the door and walking toward it to see what is there. All the while the scene is very comforting and inviting. It's what I was thinking of as I created it, and love the discovery of it. Wondering what will meet you there at the door as you walk into it. 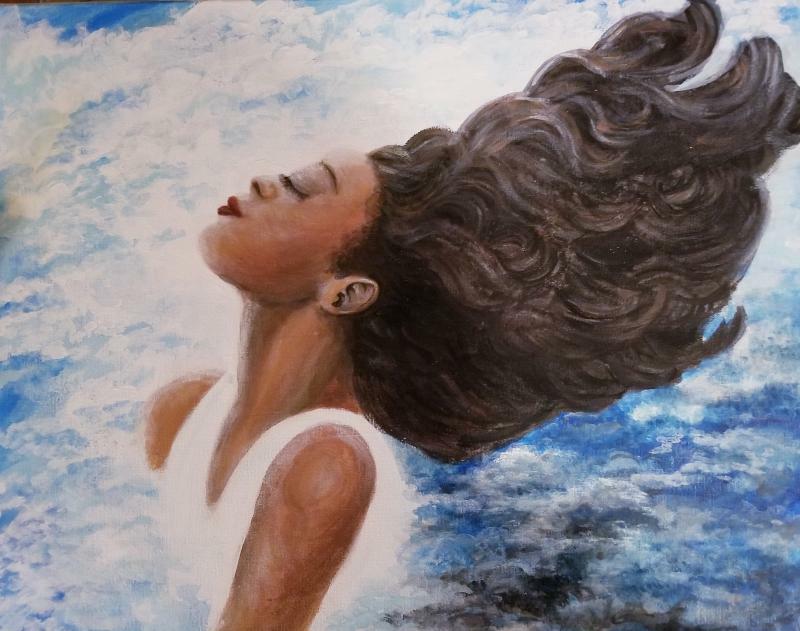 Created: 2018 Size: 16" x 20"
It's a wonderful time of reflection when the storm is there and you still have peace. I really enjoy how this original art says so much in it. I was inspired by finding ways to appreciate being where you are in the moment even when things might seem rocky. But knowing the storm always passes. It's so easy to keep peace when everything is sunny, but to feel the same way during the storm is something to keep close too. 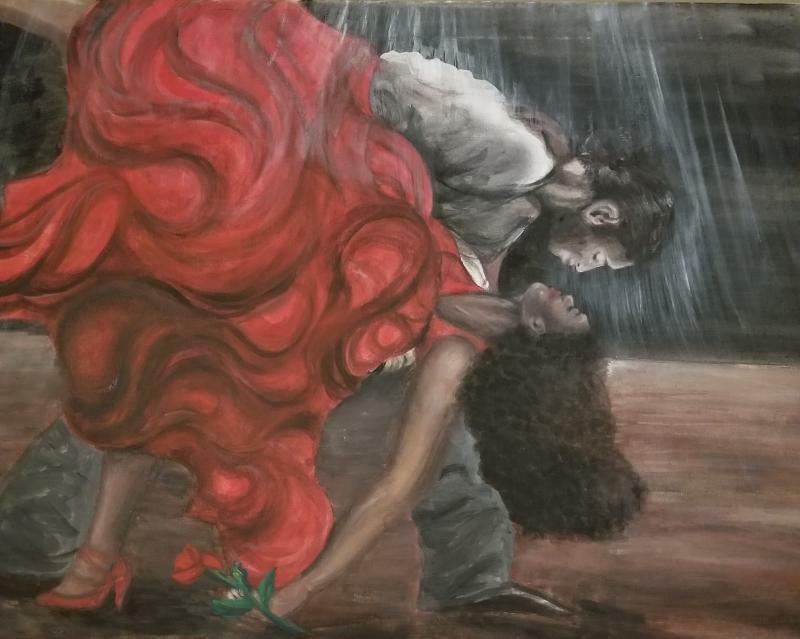 I am really feeling this original acrylic piece with a theme of ballroom dancing. The inspiration in this original took me to a place where dance is so inviting. Gives that ooey gooey feeling of closeness with someone. Knowing those next steps in dance will be beautiful. Where there is no one else in the whole world but you and your partner. Not watching where your feet go, but into the eyes of someone who will not let you fall. When I was young, I took ballet lessons. It was such a joy to me. Often time, before my class started, there was another class of older ladies, maybe in there late teens, still in class dancing before I got there. I thought they were so tall and graceful. I would sit there, watching and thinking, 'that's going to be me one day.' 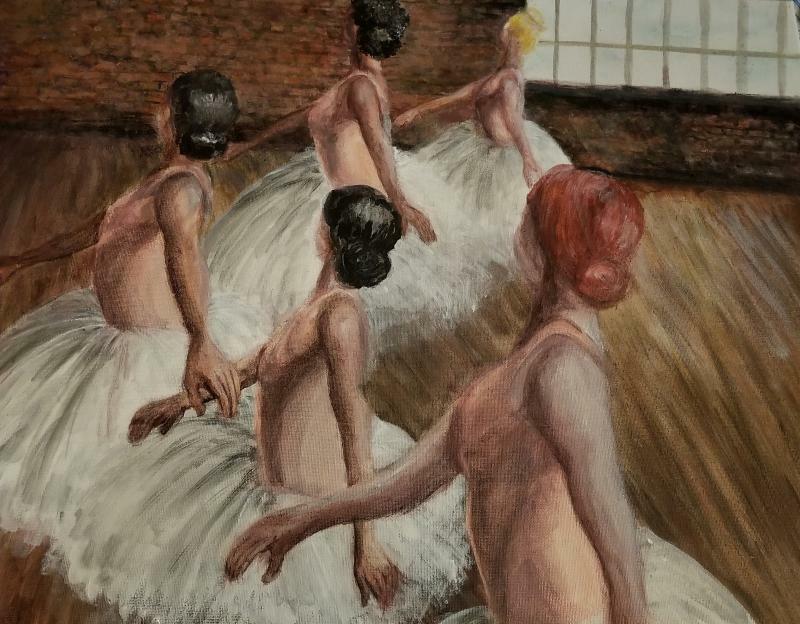 In my inspiration, I decided to create a little different and it make this piece in a scene with brick walls and different shades of women dancers. I will never forget Ms. Bridget. She was a natural red haired lady, and so encouraging. 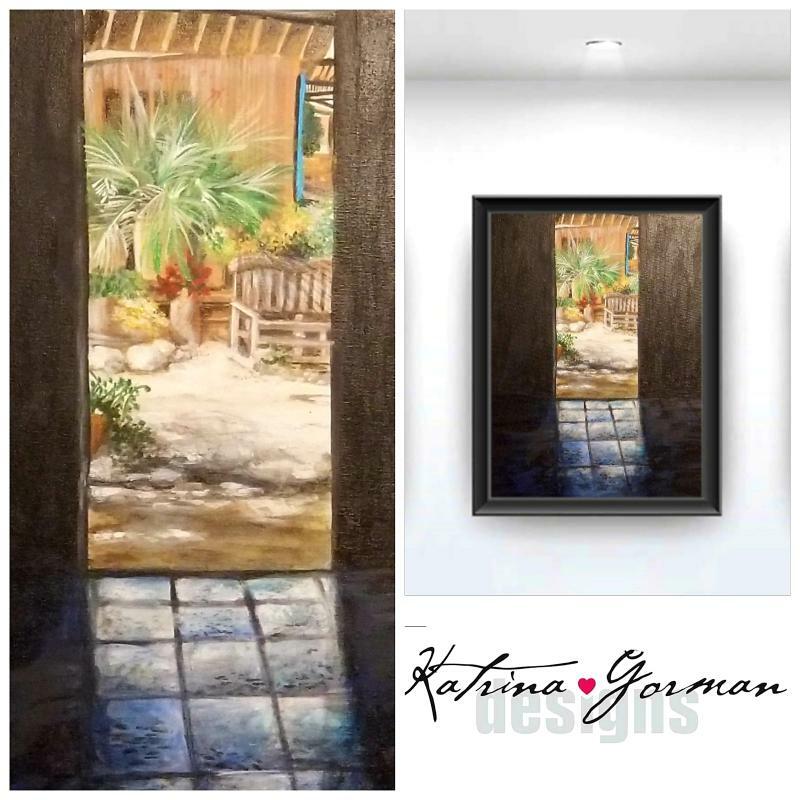 So many great memories were rediscovered and brought anew while creating this acrylic piece thinking on that great time watching them dance. There are some places you go to be in peace. Especially if you have a decision that is weighing on your mind. Or need a moment to just breathe. That was the inspiration behind this art original. Takes you to a place where you can feel that solitude by being at one with nature. * Price includes TX Tax / Shipping & Handling $25.00 for US residents﻿﻿ / International shipping to be determined. 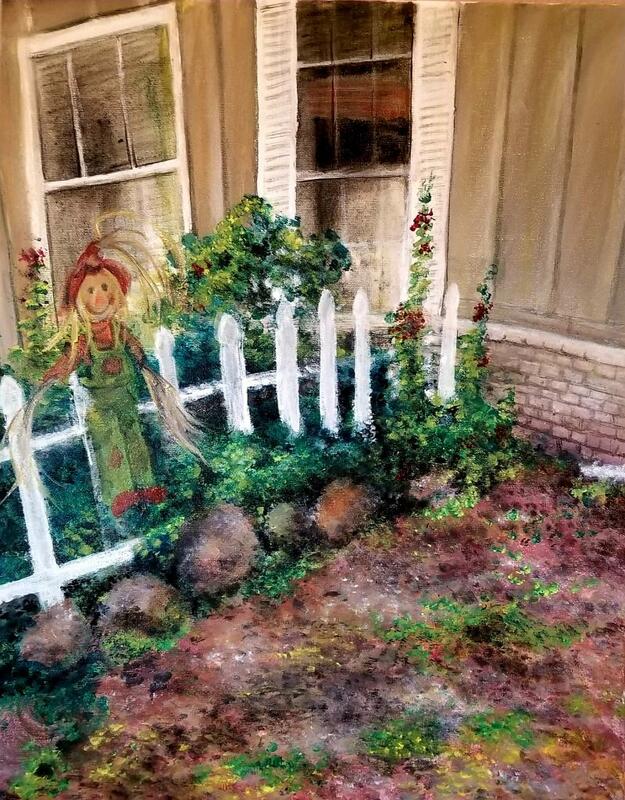 Created: 2018 Size: 12" x 16"
When I decided to bring a little happy onto my porch. Little yellow flower, growing wild and free. I decided she would look great when I repoted her over by the porch. Bringing sunshine into her green leaves and attracting butterflies like she does. This art imitates life in a big way bringing in the sunshine. So pretty. How beautiful is a time spent with a friend at a coffee shop, meeting for the first time, from knowing each other for years online. It was a special afternoon where just around the way, walking outside, this little garden sat there, so inviting and beautiful. 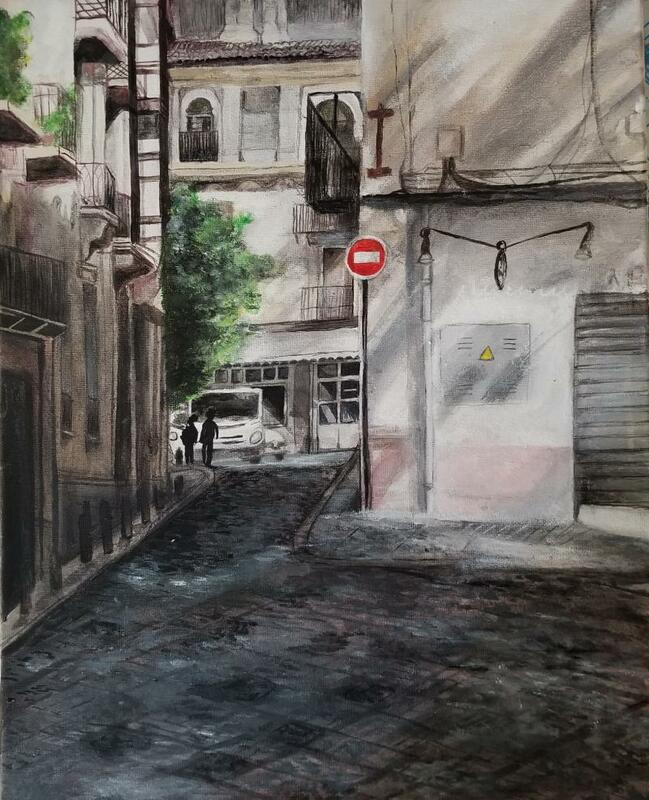 This is where I got this inspiration to create this piece, knowing the best times spent are with great company. Bringing this beauty to life through original art. Ever been to one of those places where the world just stops? 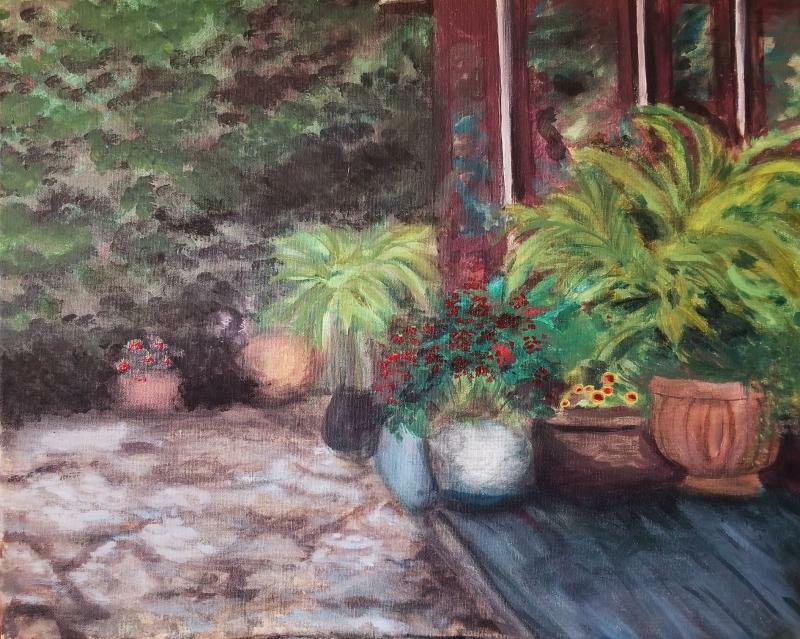 Well, back in the Spring, I was invited to Round Rock Texas to paint with my friend Janet, in her garden. Her new garden was so fresh and alive already. Sweet little flowers had already started to bloom as she was telling me about what she planted, and vegetables that she wanted to plant too. After I sat down, it was so relaxing, watching the butterflies dance in the garden. A beautiful place where your mind is still. It was such a lovely time when I visited Malaga Spain. Coming from the parking garage, walking up to the street, so much beauty was all around. Comforting tall buildings with dark shadows, made it surroundings look like night time in the middle of the day. Rot iron window coverings and brick laid streets. I was so inspired by the anticipation of what was soon to come up ahead. 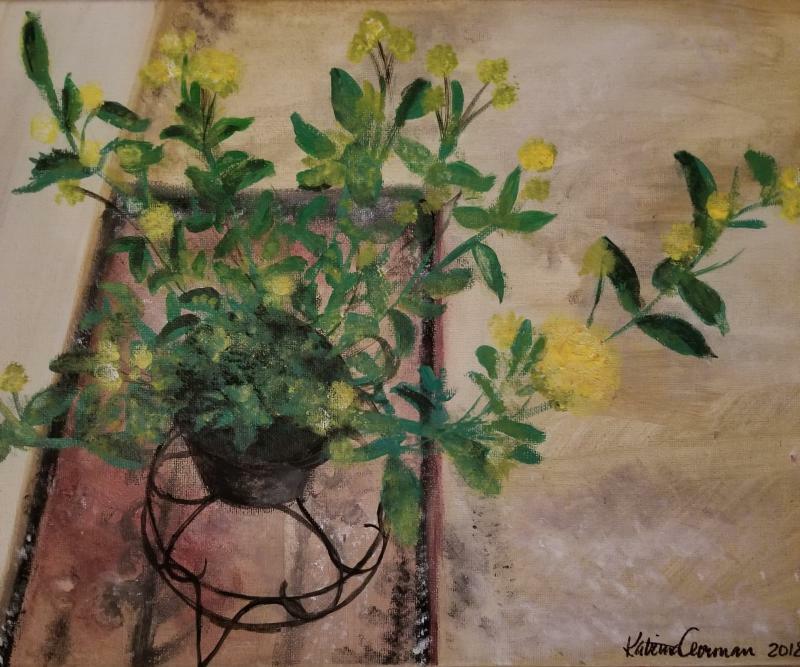 I was invited by a friend to come paint with her and a group of artists. It was such an enjoyable time to be surrounded in silence as everyone painted so freely. 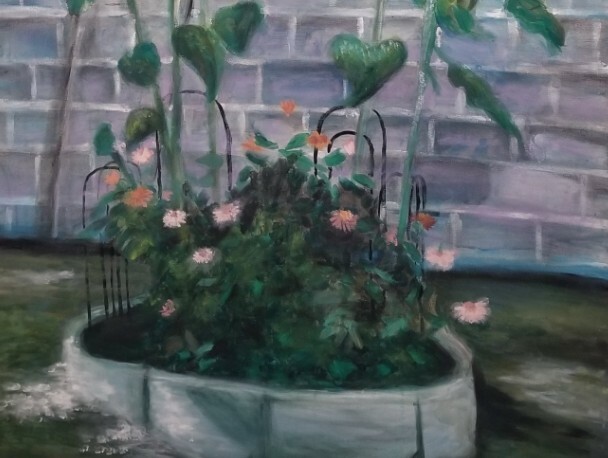 Where we painted, the home had much beauty in the garden and all around. 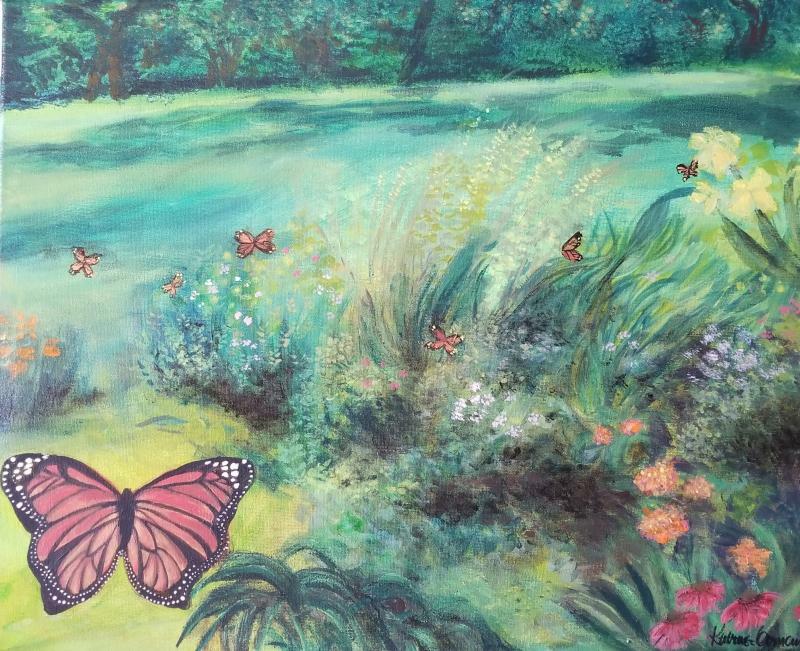 Spending the afternoon painting this piece, and soaking in nature all around brought this beauty to life. 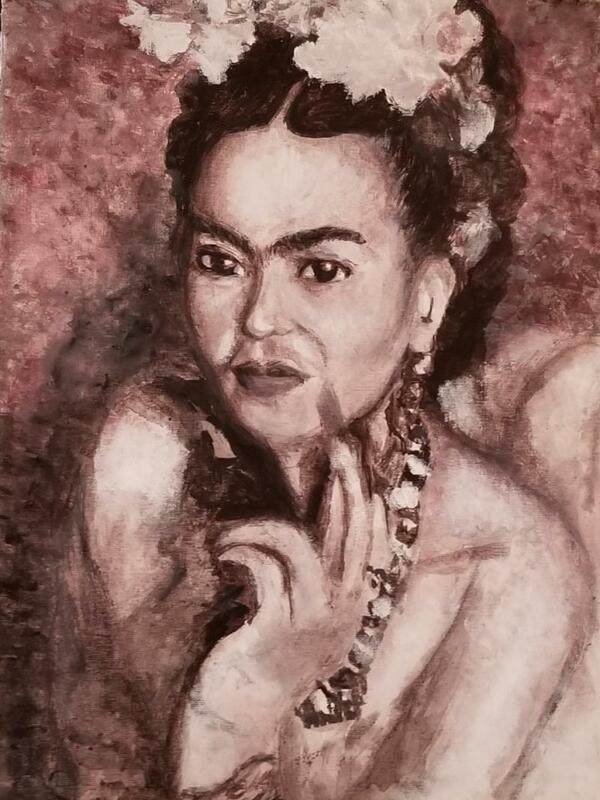 This was the first portrait I created, inspired by Frida Kahlo. She's one of my favorite artists for so many reasons. One of the most important to me is how she lived her life by being herself. Often in her life she was criticized for the things she did, and lived with her own truth in spite of that. So I named this piece "Beauty Frida", not just for her outward beauty, but for the beauty she claimed for herself on the inside. This is an image where I'm putting on that last finishing touch, sprinkling on the love. After each original are finished. I create a black border around the canvas and each are sealed with a mat varnish to protect your treasure for years to come. Would you like an art piece custom made for you?